Slowly mix in the water and stir until the pastry comes together into a ball (you may or may not need all the water so add it gradually). After about 30 minutes roll out the pastry on a lightly floured work surface and use it to line 4 x five-inch fluted flan rings. I normally return the flan rings to the fridge at this stage to prevent shrinkage later. Meanwhile cut up the pepper, courgette and red onion into bite size chunks, scatter with the diced garlic and drizzle with some olive oil. Roast in the preheated oven for approximately 20-25 minutes. Whisk together the eggs and the milk with the thyme leaves and the grated cheese. Divide the roasted vegetables between the bottoms of the pastry lined flan dishes and then divide the egg and cheese mixture on top. 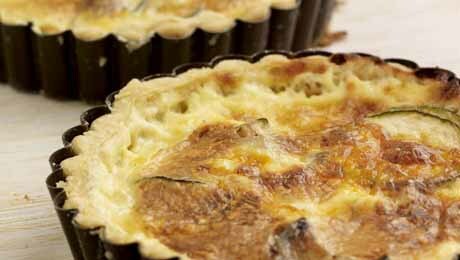 Place the fluted flan rings onto a flat baking tray and bake in the preheated oven for 25-30 minutes or until the egg custard is set and the pastry has turned golden brown. Mix together the lettuce, grated courgette and tomatoes with the olive oil. Serve the tartlets immediately with a little salad.